At IFBC this year they did something a little different. 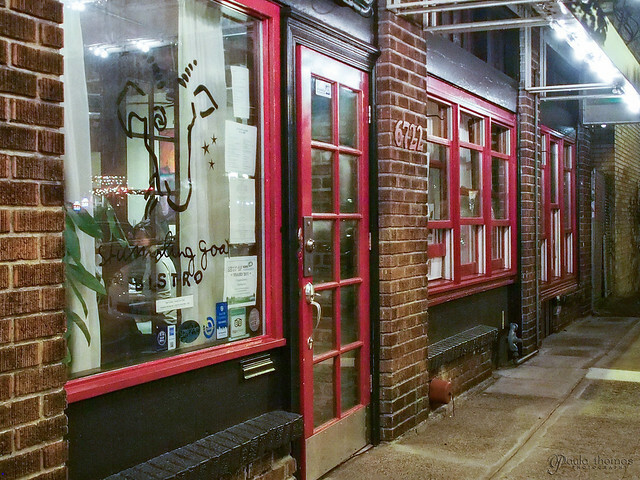 Urbanspoon made reservations for all of the attendees to have dinner at different restaurants all around town and even took into consideration those with dietary restrictions. They didn't tell everyone where the dinners would be but we were told via our name tags when we registered what neighborhood and time the reservations would be. There were around 25 different groups and only one of them was a gluten free one. I'm surprised there wasn't a bigger group of gluten free people but I was told I was in the only group and there ended up being 8 of us. I know a few people didn't show up for the dinner and I can't imagine why anyone would pass up such a wonderful meal. It was a fun experience despite our late reservation of 9:00 PM. We did get a pre-dinner snack to tide us over until dinner but I didn't get home till around midnight. I definitely don't regret going and would do it again in a second. They are planning on an even bigger IFBC 2014 conference next year and will do these secret spoon dinners again. I've already registered and am looking forward to it. Stumbling Goat was our destination. I had never been there before but have heard of it and have been wanting to go. They were very accommodating to everyone's food restrictions and made a custom 5 course meal just for our group including wine pairings. I think 5 courses of small sized plates is the perfect amount of food for me. Anything more than that and I wouldn't be able to eat it all. They have homemade gluten free crackers that we got to munch on which was paired with some dipping sauce. 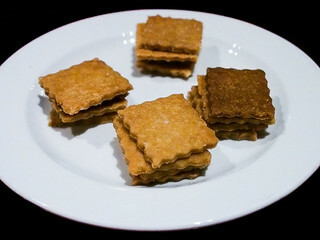 The crackers were crunchy with the perfect amount of salt, a great preparation for the wonderful meal to come. Thanks to Erica aka CeliacBeast for asking about them or we might not have gotten to try them. 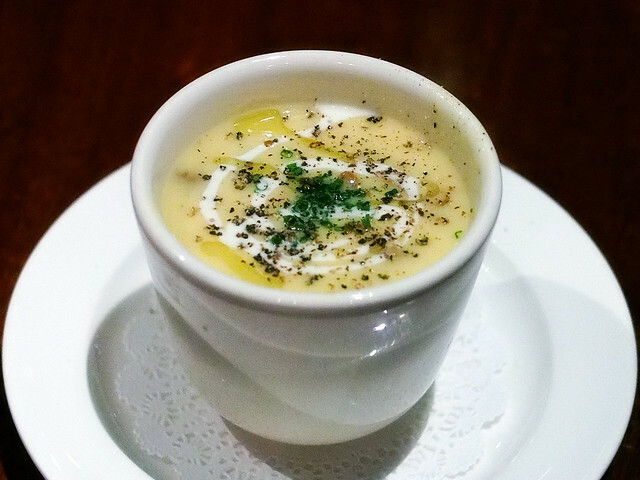 We started off with a corn and chanterelle bisque with Creme Fraiche, truffle oil and chives. I'm not a huge fan of mushrooms but I didn't think the bisque was too mushroomy so I really enjoyed it and the truffle oil wasn't overpowering like you always see when they use it in cooking shows. 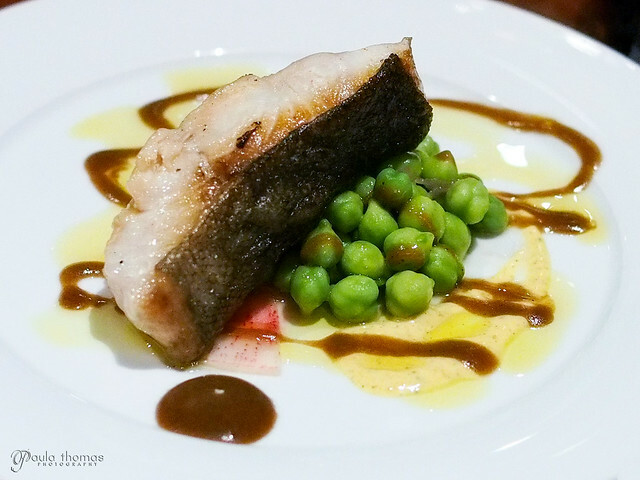 For the second course, we had pan seared black cod with garbanzo beans, curry yogurt and black garlic vinaigrette. The garbanzo beans were raw which I don't believe I've ever had before and they were quite good. They were soft yet kind of crunchy too. The cod was perfectly cooked, moist with a crispy skin, just the way I like it. I always love when restaurants serve sorbet as a middle course. 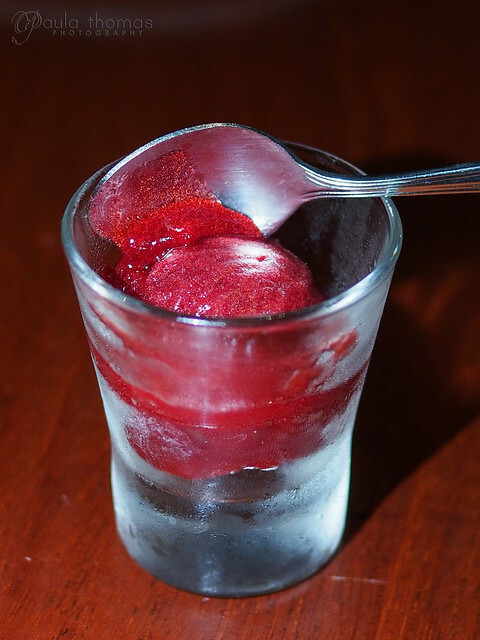 I always think of sorbet as a dessert item but it really works in the middle of the meal to break up all the heavy rich courses and cleanse your palette. We had black currant sorbet and it fresh and not too sweet, just a perfect mid course dish. 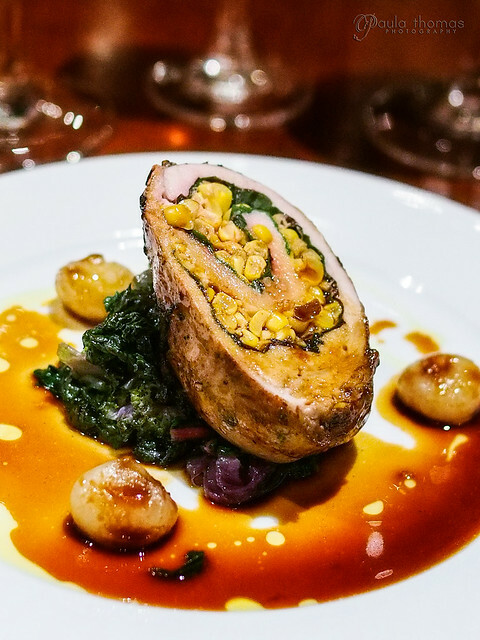 The fourth course was a beautiful rabbit roulade with smoked corn, red chard and cipollini onions. It was very nicely presented and I think I've only had rabbit once before and it really does taste a lot like chicken. I would have never though looking at it that it was a rabbit, I always expect them to be so much smaller. The final course was a flourless chocolate cake with chocolate ganache, salted caramel gelato and espresso milk chocolate caramel. I haven't really eaten much if any dessert in the last couple of years. I've been trying to stay away from sugary, sweet things but I made an exception and ate this cake which was just divine. It was much better than I thought it would be and I ate the whole piece. I'm not a fan of fudge and that's what I was picturing it would be like but it wasn't anything like fudge it was just rich, decadent chocolate and I want more of it. 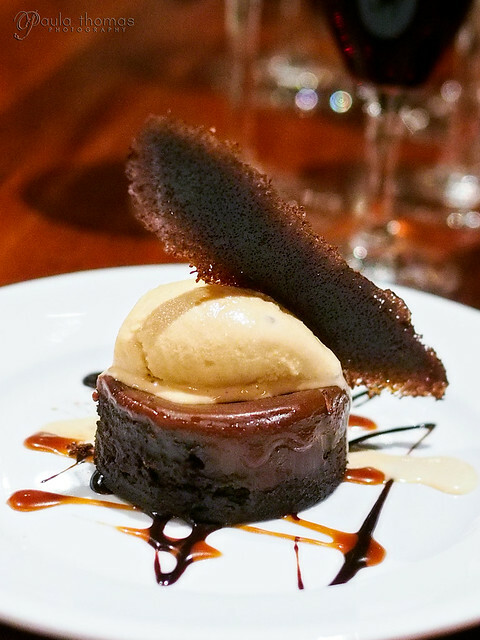 You can find the bisque and flourless chocolate cake on their menu but they change their menu every season so there's no telling how long they will stay.